April marks Earth Day and the official global launch of 2020 or Bust, mobilizing 500 million people over the next two years to get humanity on track to ending the climate crisis. Key to realizing this mission is youth engagement. 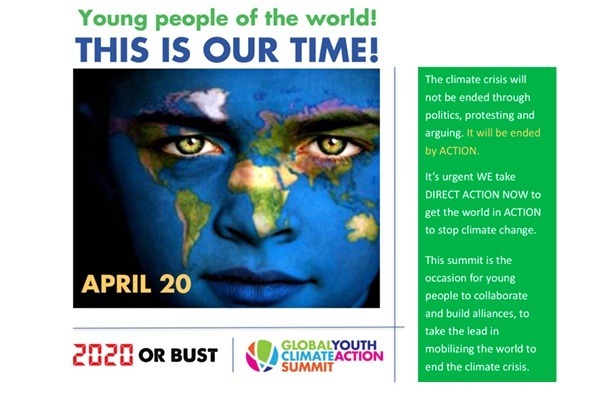 On April 20 we will be hosting in partnership with The New School the first ever Global Youth Climate Action Summit. Young people from all over the world will be coming together to be empowered as leaders in taking the real actions in real time to produce the real result of a sustainable future. This event is also where the 2020 or Bust youth-created marketing campaign "Don't Let the Planet Get Hotter than You!" will be launched. Your donation is an investment in our youth, in our planet, and in our future. Thank you!